Discussion may still abound about the mobile shift in handheld gaming markets, but the 3DS is showing all the signs of recovery Nintendo would have hoped for after its shaky launch. 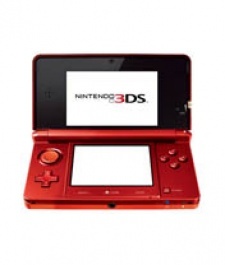 Japanese sales figures for 2011, collated by 4Gamer and Media Create, reveal the extent of the holiday season spike in 3DS sales in its home market compared to other gaming devices. Its 40 percent price cut, combined with strong first party releases saw Nintendo's newest handheld leaving its competitors in the dust. 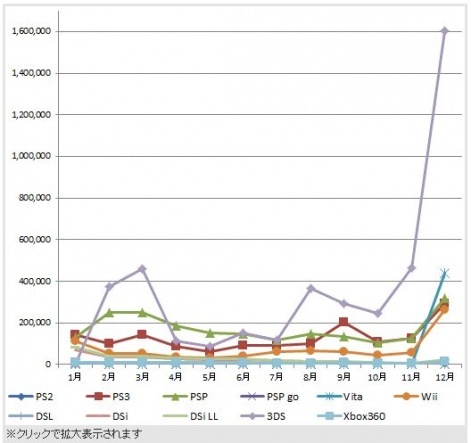 And as the PS Vita made its late December 2012 entry into the market, the month-by-month lists of sales also show the death of Sony's ill-fated PSPgo. Below you can see a colour-coded chart, with the light purple line representing the 3DS. As you can see the massive holiday sales spike of 1.6 million sales dwarfs the second place PS Vita, which managed just over 430,000 sales. The PSPgo reached a grand total of zero sales in December, though how it has managed to survive this long is a subject of debate in itself. The tables below show month-by-month hardware sales for 2011. The first two columns show total sales for 2011 and total lifetime sales respectively. As for the most popular games of 2011, three 3DS titles took the top three spots in 2011 sales. Mario Kart 7 was in first place with 1,160,169 sales, followed by Super Mario 3D Land with 1,080,192. Third place was taken by Monster Hunter 3G from Capcom, selling 985,498 before the end of the year, though it has since gone on to become the third 3DS title to sell over a million units.